It has been a while –months perhaps– since I’ve worked with confectioner’s sugar, fondant, royal icing or anything of the sort… Turns out my frosting skills are rather rusty, too. This was all evident to me when I spent an afternoon with GLAMPOP gals, Cyn and Carms. Thank goodness I wasn’t there particularly to pipe –phew– but rather I was summoned to sprinkle myself silly! 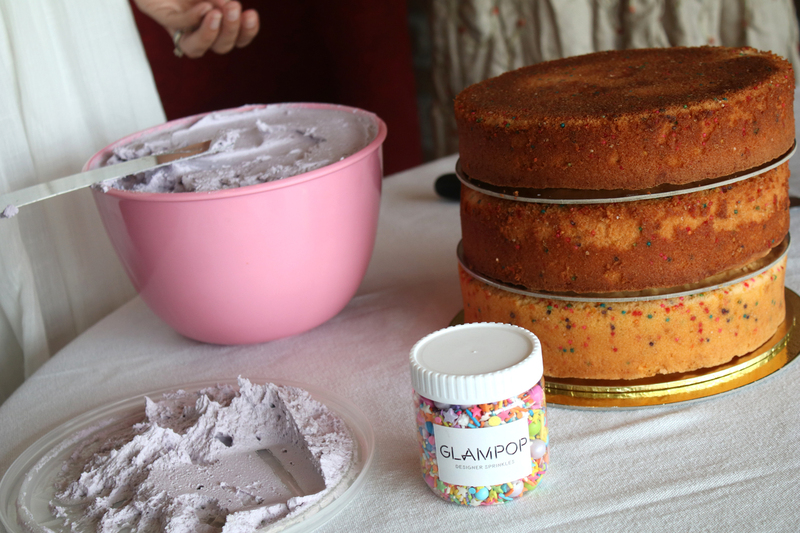 The girls introduced me to their line of high-end designer sprinkles, GLAMPOP. Harboring a deep devotion for all things ‘glam,’ coupled with a manic infatuation for the sweeter things in life, the trio of Cyn, Carms, and Mel joined forces together with their skill sets; varying from pasty chef to business owner and graphic designer to cake artist. 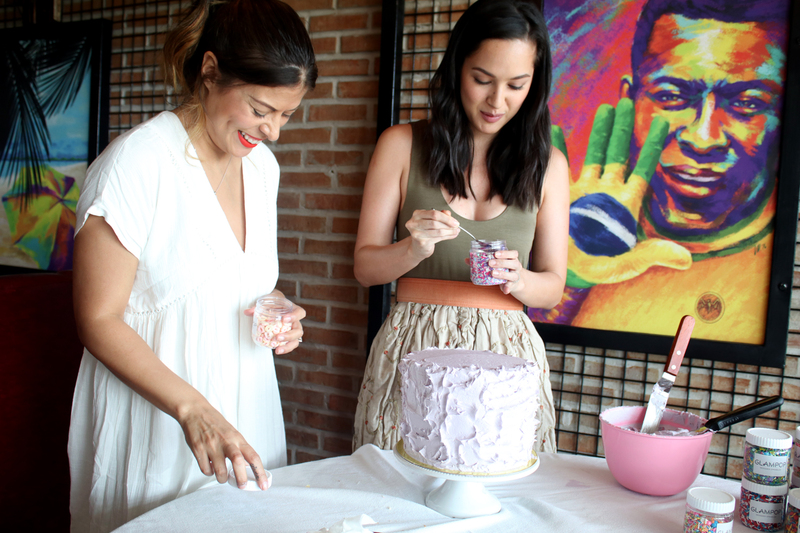 Each running their own confectionery ventures, the ladies take aim at helping the professional baker, obsessed dessert junky, artistic maestro and anyone else who shows the desire to transcend their very own creations into eccentric masterworks. 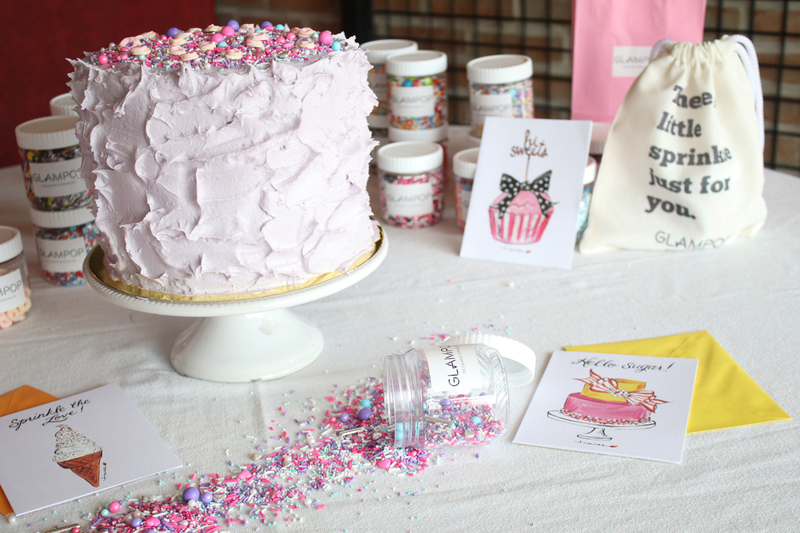 Sprinkles have coated the world of baking, we see references and pegs on Pinterest, Facebook videos and Instagram daily. 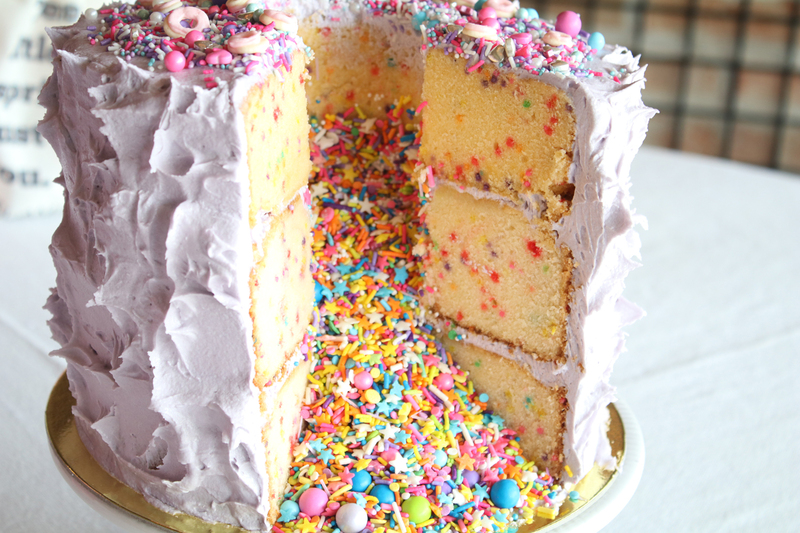 In home kitchens, sprinkles show up in cakes, cupcakes, cookies, waffles, pancakes, you name it. Being a baker myself, I congratulated Cyn and Carms on the new business and exclaimed, “Amazing! We so need this in our local market!” Finding ‘jimmies’ in town can end up being quite the scavenger hunt if you’re looking for something specific and stirring. Options are slim and alas alike. With their pre-packaged mixes like Mermaid Lagoon, Aloha Baby and Captain America, GLAMPOP offers decorettes that will successfully transform your goodies from ordinary to extraordinary – their selection is wonderfully unique with color palettes and combinations I’ve not seen offered here before. I wanted to create my own photogenic piece with GLAMPOP, post-worthy to share on social media like everyone else. See below how much freakin’ fun I had achieving it! 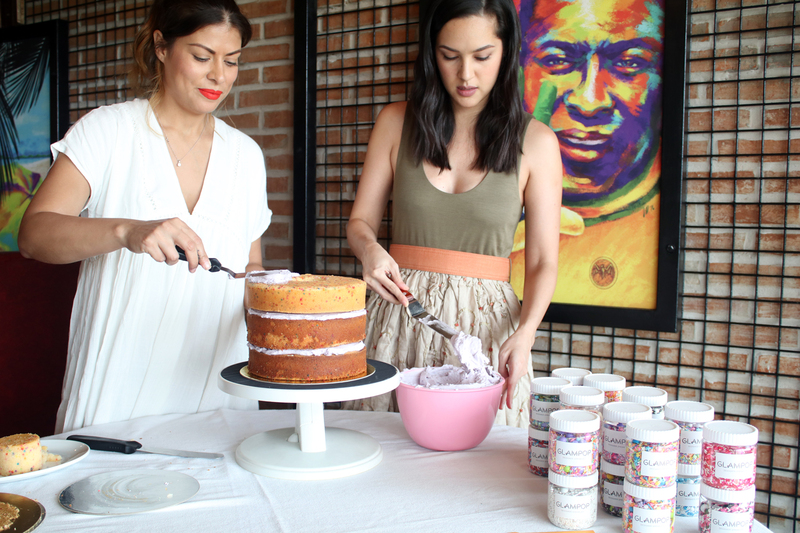 Our starting lineup consisted of lilac butter cream, a naked 3-tier vanilla funfetti cake, and GLAMPOP’s Razzle Dazzle. 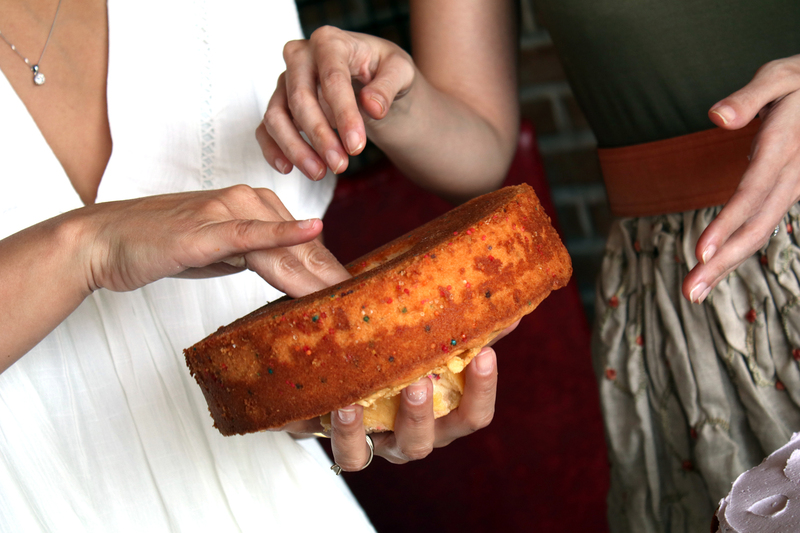 Before we moved the cake layers to the rotating turntable, holes needed to be punched out of two of the centers so as to make room for our razzly dazzly surprise. 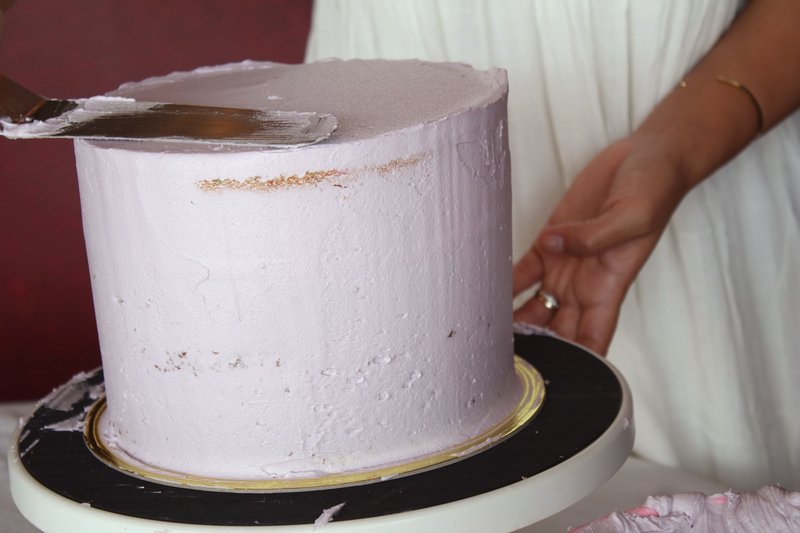 After putting our gold cake board in place, we started ‘gluing’ the funfetti discs on top of each other with the lilac ‘paint’. It was time to fill the deep, certainly not dark, rainbow hole with GLAMPOP’s Razzle Dazzle – that was fun! 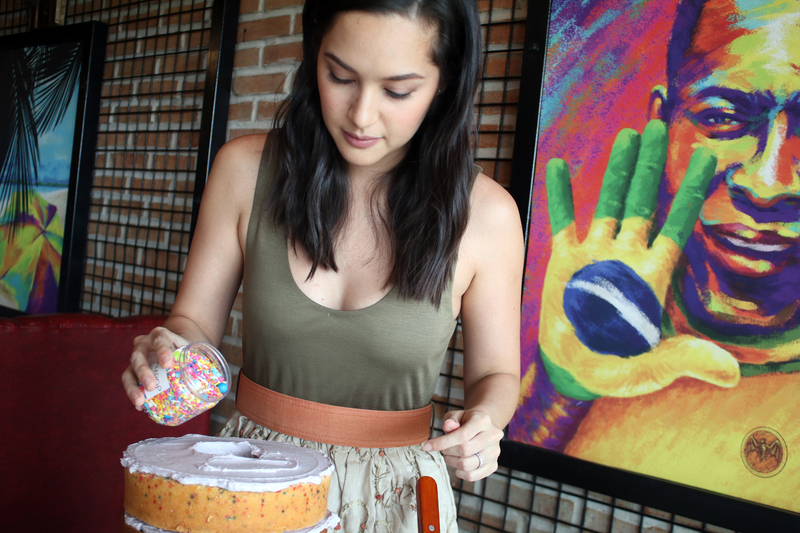 I’ve just finished pouring the sprinkles inside, and it’s time to seal the lid! …Oh, and frost the rest of the cake. All credit to Cyn for achieving the fluffy purple poufs I wanted! You can see us both getting ready to play, GLAMPOP bottles in hand. 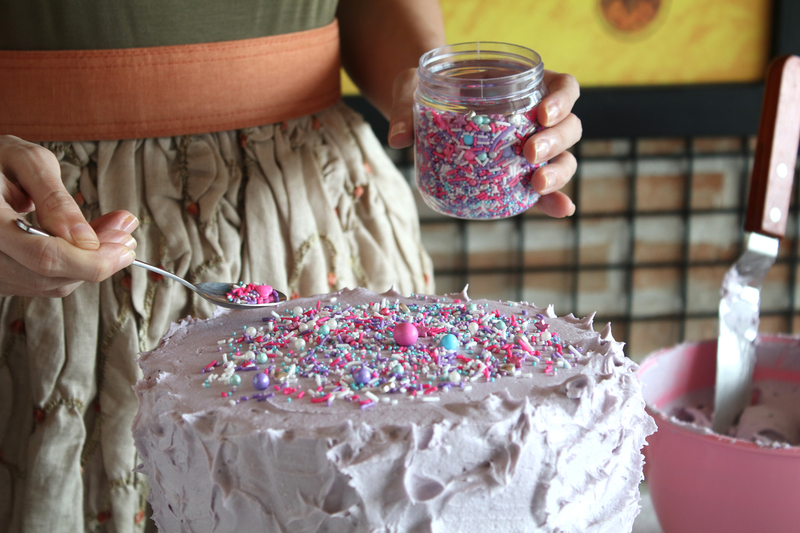 Here I am spreading GLAMPOP’s Unicorn Dust preparing for the fairy feeding. We heard that fairies love donuts as much as we do, so we scattered some of GLAMPOP’s mini frosted donuts to make them happy. From ooo’ing and ahhh’ing at our masterpiece, we still had one more thing to gawk at. 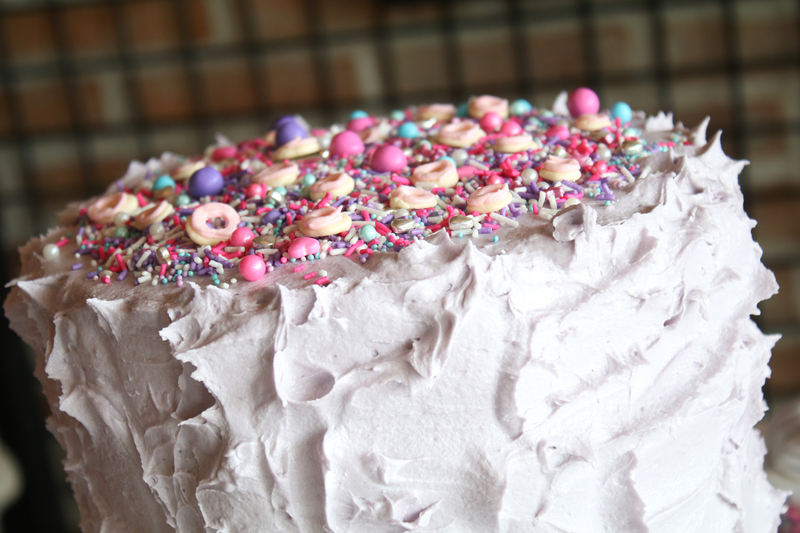 Look what happened when we sliced a thick chunk out – our cake threw up even more food for the fairies. GLAMPOP is generous like that.